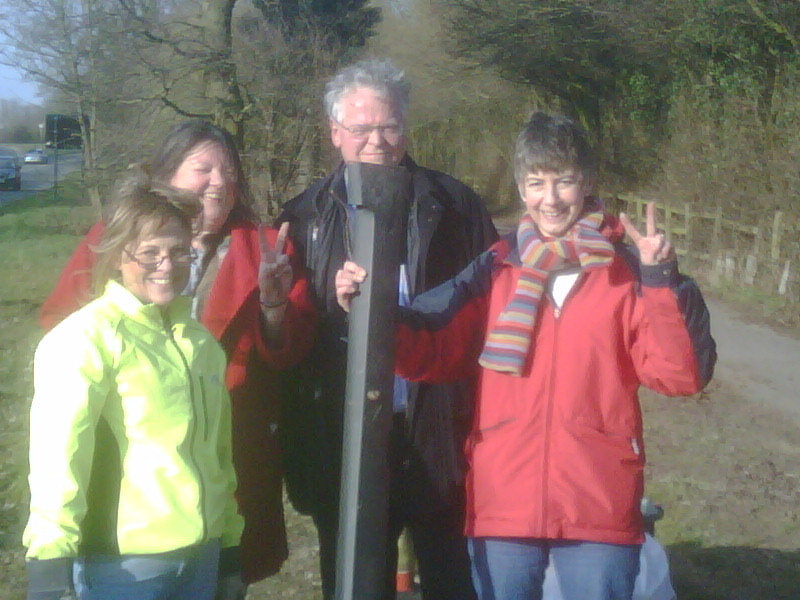 For the last 2 years there has been an “Oxclean” campaign to collect litter and tidy up any neglected parts of Oxford. This year, members of the Victoria Road Group felt that if there were areas nearby where volunteers were proving hard to come by we might raise a posse to do our bit. On Sat 6th March, five of our Victoria Road volunteers spent the morning picking up litter around the A40 flyover near Marsdon. This was really hard work, but rewarding. There must be many areas like this, where there is no clear household responsibility for keeping the area clean, so we hope everyone makes everyday an opportunity to help keep the city and countryside free of litter. Many thanks to all of the volunteers (some of whom are pictured below). Many thanks to all of the sponsors, which included The Oxford Times, MacDonalds, Oxford Civic Society, The Helping Hand, Grassroots Grants, and the Oxford City Council. A recent police operation during January and February to target offenders in Oxford has reduced crime overall across the City. All crime = 1,549 10% reduction. Please bear in mind that although the percentage increase in robbery is high the number of offences, less than one a day, is relatively low compared with other crime in the City. The police will continue to focus attention on robbery offences and provide crime reduction advice through the Neighbourhood Teams. The URN for this message is 1443/12/02. Unfortunately after the message we sent out on Friday there were three Distraction burglary’s just outside of the Oxford area and one in the Oxford area. The Distraction burglary took place on Jackson Road, Cutteslowe on Friday 12th February at about 8.30pm. The method of entry was different from the previous reports. The burglars gained entry under the guise of “Water board workers” who said they were “dealing with an emergency which had occurred up the road at a neighbours house”. The burglars got away with cash and jewellery. One of the males was white in his forty’s, with sallow skin, about 5’2 and of medium build, he was wearing a dark woolly hat, navy blue overalls and glasses, he spoke with a cockney accent. Please continue to warn all your neighbours especially the elderly and venerable. The message we would like you to pass on is “not to let anybody into your home” without an appointment even if they say it is an emergency. Or why not join the “password scheme”. Thames Water operate a doorstep password scheme which is open to all customers. Once you register a personal password, any caller claiming to be from the local water company must say this password before you let them in. If they can’t give your password, keep the door shut and call us straight away. Join our password scheme by calling our Customer Centre on 0845 9200 800 (Minicom 0845 7200 898). All our main suppliers operate the same scheme. To contact Southern Electric – 0800 622 838. British Gas – 0800 072 8625. News coverage of wind turbine plans for Oxford have been report in the Oxford Times and the BBC News. One is planned to be sited near Cutteslowe Park. What do you think about the plans? This message is sent to you on behalf of PC Jan Robinson the Crime Reduction Officer for Oxford City. There have been several offenses over the past few weeks just outside Oxford City where offenders pretending to be Police Officers have tricked elderly people into opening the door. The most recent case was near Bicester last night. The current story is that there are people in the garden and that the Police have retrieved money from them and need to check if it belongs to the householder. Apparently the bogus Police Officers are wearing uniform similar to official Police uniform and carrying ID cards. Please be extra vigilant and remind any particularly vulnerable or elderly neighbours not to let anyone in even if they say they are from the police without checking first. The best way to check if the Police Officer is genuine is to 1)ask the Officer for their name and number 2)ring the Police Control room to check if they are legitimate on 0845 8 505 505. Any genuine police officer won’t mind waiting. Several residents have been interested in the issue of car clubs, following the success of the one in East Oxford. What do people think about this kind of scheme?